Born: 26th January 1889, Wanstead, Essex. 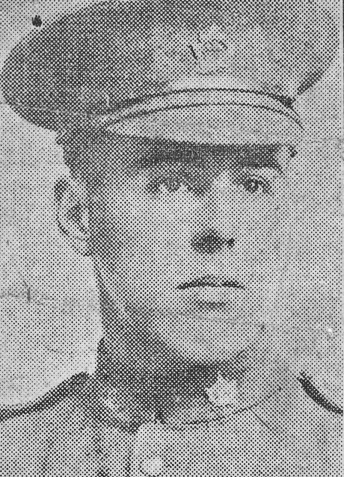 Died: 13th September 1916; age 30; Died of Wounds – About 8pm, on the 13th September 1916, he was returning from the forward area to reserve billets in the Rue de Bapaume, Albert, when he was wounded by shellfire. He was taken immediately to No.3. Casualty Clearing Station where he died the same evening. Enlistment Details: Location: Winnipeg, Manitoba, Canada; Date: 13th April 1915; Age: 29 years & 3 months; Occupation: Telegraph Lineman – C.N.R. ; Religion: CofE. Next of Kin: Bessie Cripps, of 182, Wherstead Road, Ipswich. Height: 5ft & 7 1/2ins, dark complexion, dark eyes & dark brown hair. Regiment: Canadian Engineers, 1st Division, 3rd Field Coy. 1891 Voluntary Place, Wanstead, Essex. Charles was 5 years old and staying with his paternal grandparents & aunt & uncles. Richard Cripps, 68, a Stoker, born Alvescot, Oxfordshire. Mary Ann Cripps, 61, born Essex. Mary Ann Cripps, 33, a Dressmaker, born Wanstead. Richard, 30, a Labourer, born Wanstead. Henry J. Cripps, 28, a Labourer, born Wanstead. Francis, T. Cripps, 25, born Wanstead. 1901 182, Wherstead Road, Ipswich. Charles was 15 years old, a Clerk. He was living with his parents & siblings. Charles Cripps, 45, a Railway Advertisement Inspector, born Canning Town, Essex. Elizabeth Cripps (nee Townsend), 48, born Oxford, Oxfordshire. Alice Victoria Cripps, 14, born Wanstead. Lily Cripps, 12, born Wanstead. Bessie Cripps, 10, born Wanstead. Cyril Francis Cripps, 4, born Ipswich.